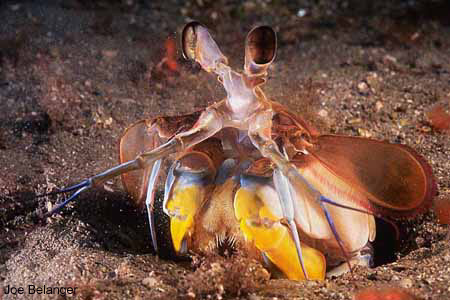 About the Mantis Shrimp: Mantis shrimp live in sandy burrows on sand or muddy bottoms in subtidal water to more than 200 feet. They range from Santa Barbara to the Gulf of California. Size to 12" (300 mm). Photographed at Santa Barbara Island using a housed Nikon N90, Nikon 105mm 2.8 macro lens with +4 diopter and 2 Ikelite Substrobe M’s. Exposed at f16 @ 1/60th . 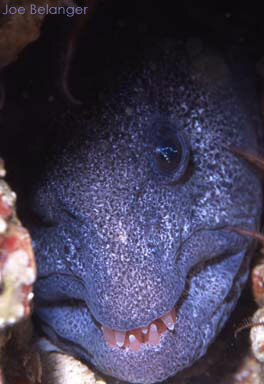 About: Actually a fish and not an eel, the wolf eel has canine teeth and can usually be very approachable. 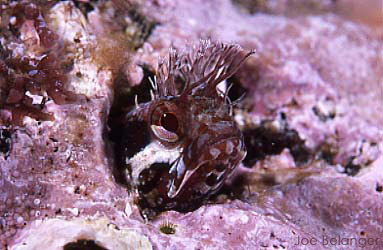 They live in crevices and are known to live in dens with other eels. Found shallow to 700 feet. 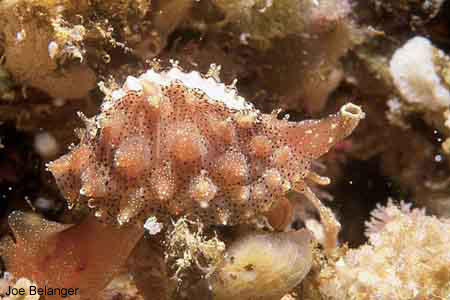 Feeds on hard-shelled invertebrates and fishes. Range from Alaska to southern California. Photographed at Santa Barbara Island using a housed Nikon N90, Nikon 105mm 2.8 macro lens with +4 diopter and 2 Ikelite Substrobe M’s. Exposed at f32 @ 1/60th . About: Found in holes on rock-slate bottoms. Will maintain hold for nice photo opportunities. Photographed at San Nicolas Island using a housed Nikon N90, Nikon 105mm 2.8 macro lens with +4 diopter and 2 Ikelite Substrobe M’s. Exposed at f22 @ 1/60th . About: Highlights include nearly translucent tentacles with yellow-brown cup. In depths from 30 to 200 feet. To 4 centimeters in size and range from California to Baja. Photographed using two Ikelite substrobe M's with a Nikonos 2:1 extension tube setup at f22. 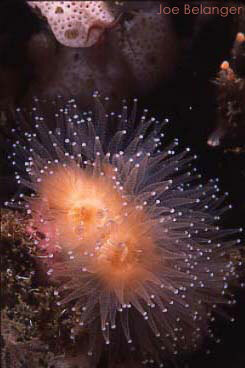 About Solander's Trivia: Found on rocky reefs under rocks from the intertidal zone to 50 feet. Range from Palos Verdes to Panama. Size to 3/4" (20mm).